Imagine, if you will, a British college drama club producing a murder mystery, rife with amateurish gaffs, and having it turn into a West End and Broadway hit. As difficult as such a proposition may seem, a sharp group of producers saw the potential in a trio of writers framing the fictitious Cornley University Drama Society's The Murder at Haversham Manor as a spoof on the ultimate actor's nightmare, and branding it as The Play That Goes Wrong. The gamble paid off in spades and garnered the Olivier Award for Best New Comedy (2015) and the Tony Award for Best Scenic Design of a Play (2017). For those who enjoy the irreverent humor and physical pranks of Monty Python, the show is a gold mine of guffaws and giggles, all drawn from the world of theatre. More things go wrong than you can slap a stick at: stuck doors, forgotten lines, misplaced props, missed cues, broken fourth wall, cold-cocked actors, and more. The set itself (designed by Nigel Hook) is one of the stars of the show—the mantle falls, the elevator fails, paintings drop, and a floor and a lighting fixture collapse. The climax is a wonderful homage to Buster Keaton's film Steamboat Bill, Jr. (1928), when virtually the whole of the remaining set collapses, one piece at a time, barely missing the actors. The ensemble has fun with the melodramatic script, mugging for audience, and feigning embarassment at their shameless scene stealing and showing off. Thus, aside from the play-within-a-play conceit, we have a talented group of actors pretending to be bad actors, which produces a string of inside jokes. A special treat for Denver theatregoers was the return of locally grown favorite Jamie Ann Romero, as Sandra, the dead man's fiancé. Romero vamps and cuts up with aplomb. When she flashes that big diamond ring while posing as the grieving betrothed, she becomes the first suspect. "The game is afoot," as Sherlock would say; and sure enough, a Holmes-like character, Chris (Evan Elexander Smith) is on hand to investigate the crime. Given the arch-detective's dry and calculated approach to the crime scene, Chris becomes the natural straight man to a series of comedic ploys. In the end, the Holmes send-up is thoroughly satired, suffering the worst indignities to his stellar reputation, a unique additional twist to the ever-growing body of tangents to Conan Doyle's original tales. Amidst the mayhem, Smith's stiff upper lip reminds us that this is, after all, a murder mystery, and that the list of suspects keeps growing. 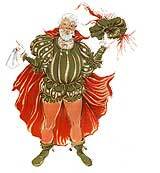 Even with a number of hints, we never guessed who would ensnare whom. 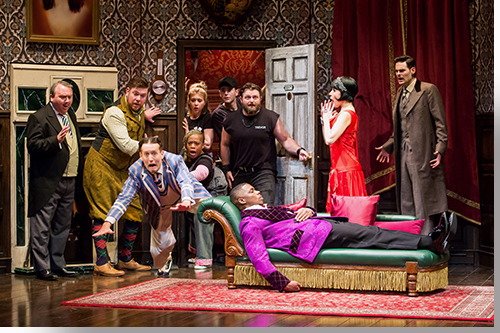 The Denver Center for the Performing Arts—Broadway presentation of a Mischief Theatre production of The Play That Goes Wrong, by Henry Lewis, Jonathan Sayer, and Henry Shields, runs through March 17th. For tickets: denvercenter.org/tickets-events/the-play-that-goes-wrong/. If you enjoy our work, please Like our website.